1. An over-the-cabinet basket for getting rid of under-the-sink clutter — it's time to toss that soap from 2012. 2. A rolling double rod garment rack so a life without a big closet doesn't mean total chaos. Use the top and bottom shelves for accessories! It has two adjustable swinging hanger bars to make space for longer clothes. It also features wheels for mobility (that can lock for security). 3. A wall-mounted wine rack to make your favorite drink a work of art. Holds five bottles of wine (and up to 25 pounds)! 4. A sleek basket organizer that'll stealthily hide your clutter and actually make it look chic. Get a storage basket here! 5. An organizer rack for anything from pan lids to accessories, because staying neat is easy when it's already laid out for you. It has 12 slots so you can use it for your lids or shop until you have enough accessories to fill it. 6. A 20-pack of open-ended, non-slip pant hangers so you don't have to pile all your trousers together. Carrie Bradshaw would NOT approve. 7. A K-cup organizer to streamline your morning brew — life before coffee doesn't need any complications. Display up to 35 K-cups! Plus, it comes with a wall mount for installation ~options~. 8. 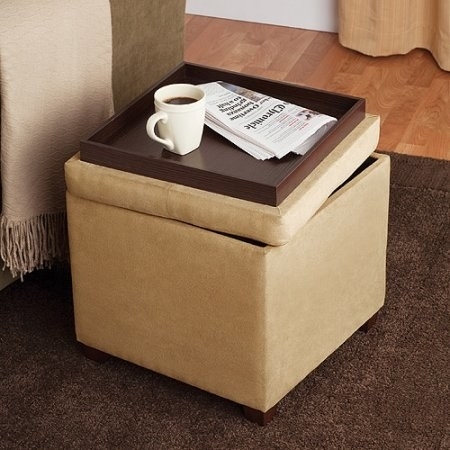 An end table with three shelves that'll upgrade your living room and hide the 100 remotes your TV requires. It has an open middle shelf and two concealed shelves (one is adjustable and one is fixed) in the bottom storage cabinet. Plenty of room for all those magazines you don't read. Price: $35.50. Also available in brown. 9. A canvas under-bed storage basket, because if you're going to just shove your mess under the furniture you should at least do it in style. 10. A bronze over-the-shower caddy so you never lose your soap, which would definitely get in the way of bathing. It has two storage baskets, a soap dish, and hooks to hang a pouf or washcloth for plenty of space to store your essentials. It's also rust-resistant so you don't have to worry about replacing it any time soon. The slip-proof collar and suction cups will make sure it doesn't fall, too! 11. 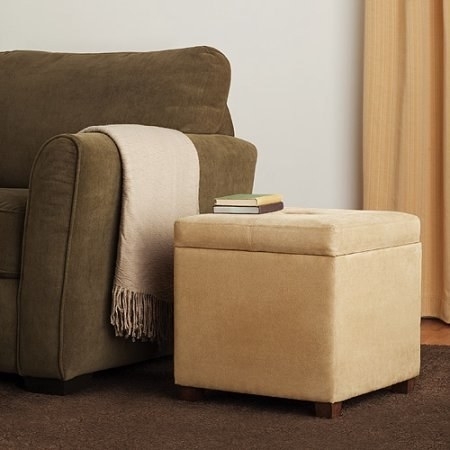 A storage ottoman to fashionably tuck away excess items like blankets or bills (just keep them there). The lid flips over to become a serving tray! Because, you know, Netflix-and-sit-on-your-couch-all-day. 12. An attachable stainless steel bag saver that'll help both the earth *and* your sanity when you can leave without tearing your place apart looking for a bag. It stores 30 plastic grocery bags (that's a lot of trips to the store). It comes with mounting hardware, two wall anchors, two screws, and fingerprint resistant coating. 13. A sock organizer for keeping socks in pairs while in the laundry — here's to all those mates that just disappeared. I hope they're happy. Not to mention you won't have to sort or match afterwards! Just place each pair of dirty socks between two sliders starting from the bottom, remover the hanger, and toss in the washer in and dryer. Then hang it up in your closet so they remain nice and organized! 14. A plastic bottle holder so you have more room in your fridge for vegetables (or, more likely, pizza). 15. A three-shelf office caddy to keep productivity ~rolling~ without any disarray. 16. A boot organizer stand that'll make your closet look better one ~step~ at a time. It holds three pairs of boots! Not to mention, it'll maintain your boots' shape AND circulate air to avoid stinky feet. 17. A three-shelf bronze bathroom space saver for keeping everything tidy when visiting the porcelain throne. Each of the three shelves are capable of holding up to 20 pounds, so go wild. 18. A wrap organizer so you can preserve your leftovers without ransacking the entire kitchen looking for foil. 19. A rollable laundry sorter to make the tiresome chore a little shorter — you're not a grown up until you know to separate whites from colors. It comes with two heavy-duty laundry bags. 20. A stainless steel motion-sensor recycling unit and trash can that'll save you time, as well as make you a #responsible adult. It holds up to 18.5 gallons, which is a lot of trash, ok. Plus, it's touch-free, because who wants to touch soggy bananas? 21. A magnetic file pocket, because desks really shouldn't look like the aftermath of a hurricane. 22. A mirrored jewelry armoire so you can kiss tangled necklaces goodbye. It has a whopping 24 hooks for bracelets and necklaces, as well as 50 slots for earrings (I am so jealous if you have that many). AND a compression fold for up to 84 rings. 84! Oh, and three large, compartmentalized trays for additional storage if the rest wasn't enough. 23. A four-tier stackable shoe rack to both keep your room orderly and subtly show off your favorite heels. Can hold up to 16 shoes!! Either fill 'er up or make your way to Nordstrom. 24. A bookcase headboard that'll be great when you're too lazy to leave your bed — now you just have to reach over for your favorite book. Its bookcase display area includes two adjustable shelves and a flip-up front panel for hidden storage (snacks?). 25. 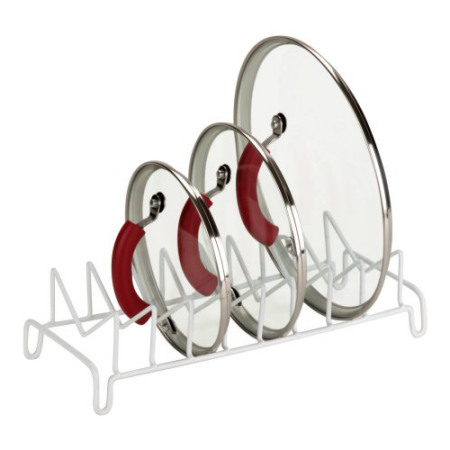 A four-shelf hanging organizer for making the most out of teeny spaces in cramped apartments. One day we'll all have walk-in closets. 26. A three-tier letter tray so you (at the very least) look put together when your boss walks by. 27. A couple of adjustable drawer dividers to help you find your spatula faster than an egg fries (or burns without a spatula). You don't need tools to install!! They expand from 14" to 21" which is the size of most drawers. Plus, they have non-slip grips on either side. 28. A wall-mount letter holder that'll save you from frenzied mornings titled, "WHERE IS MY *@#$& KEY?"